About 130 million people in the United States rely on groundwater for drinking water, and the need for high-quality drinking-water supplies becomes more urgent as our population grows. Although groundwater is a safe, reliable source of drinking water for millions of people nationwide, high concentrations of some chemical constituents can pose potential human-health concerns. Some of these contaminants come from the rocks and sediments of the aquifers themselves, and others are chemicals that we use in agriculture, industry, and day-to-day life. When groundwater supplies are contaminated, millions of dollars can be required for treatment so that the supplies can be usable. Contaminants in groundwater can also affect the health of our streams and valuable coastal waters. By knowing where contaminants occur in groundwater, what factors control contaminant concentrations, and what kinds of changes in groundwater quality might be expected in the future, we can ensure the availability and quality of this vital natural resource in the future. 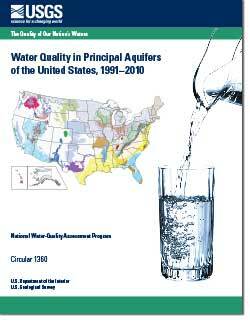 Summary Report for the National Water-Quality Assessment Program Principal Aquifers Series, "The Quality of Our Nation's Waters—"
DeSimone, L.A., McMahon, P.B., and Rosen, M.R., 2014, The quality of our Nation’s waters—Water quality in Principal Aquifers of the United States, 1991–2010: U.S. Geological Survey Circular 1360, 151 p., https://dx.doi.org/10.3133/cir1360. Chapter 7: How Does Our Use of Water Affect Groundwater Quality?